While listening to a podcast on creativity, I was introduced to the book Lifelong Kindergarten: Cultivating Creativity Through Projects, Passion, Peers, and Play by Mitchel Resnick. 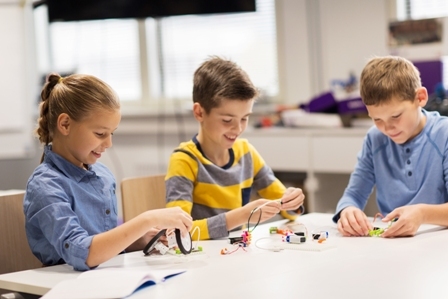 In his research paper “GIVE P’S A CHANCE: PROJECTS, PEERS, PASSION, PLAY,” Resnick discusses the research group at MIT Media which developed new technologies, activities, and strategies to engage young people in creative learning experiences. The work is guided by a constructivist approach emphasizing the value of learners playfully creating personally-meaningful projects in collaboration with peers. Projects – People learn best when they are actively working on meaningful projects – generating new ideas, designing prototypes, and refining iteratively. In a “Creative Learning Spiral” students imagine what they want to do, create a project based on their ideas, play with their creations, share their ideas and creations with others, and reflect on their experiences – all of which leads them to imagine new ideas and new projects. As students go through this process, over and over, they learn to develop their own ideas, try them out, test the boundaries, experiment with alternatives, get input from others, and generate new ideas. Peers – Learning flourishes as a social activity with people sharing ideas, collaborating on projects, and building on one another’s work. Asking for and providing help increase the opportunities for discovery and learning. Passion – When people work on projects they care about they work longer and harder, persist in the face of challenges, and learn more in the process. Play – Learning involves playful experimentation – trying new things, tinkering with materials, testing boundaries, taking risks, iterating again and again. As I listened and read about Resnick’s 4 P’s, I considered that we should be looking at the same approach for teachers working in PLCs. Projects, peers, passion, and play illustrate what I have earlier defined as the difference between PWCs (Professional Working Communities) and PLCs (Professional Learning Communities). See blog here. I’ve been playing with a phrase in some of my presentations on PLC’s: “Goals before Norms.” My thought has been that once a team of teachers identified a goal that they were invested in, there would be a reason to “live by” a set of norms. I have seen too many PLCs where the goal was assigned or quickly selected. I’ve been told that groups chose a goal that would be “easy to measure”. Using Resnick’s terms, a PLC goal should be a project of passion. PWCs know the work that needs to get done and members collaborate to “get it done.” That’s valuable. PLCs are driven by inquiry to reach an outcome in student learning that members do not know how to achieve. A creative learning spiral is needed. A PLC should function as a team with shared accountability for all students’ success. Teacher peers seek and provide feedback with a focus on teacher learning to maximize student learning. Learning is a social activity. In this video clip, Resnick describes play that generates creative thinking. He compares playing in a playpen with playing on a playground. A playpen has a somewhat restrictive environment with some limited opportunities to move and explore. On a playground, students have a much greater opportunity to move, explore, experiment, and collaborate. On a playground, children tend to make up their own activities and games. A playpen approach illustrates a fixed set of rules and a limited set of options. A playground approach illustrates experimenting, trying new things, making adjustments, taking advantage of the unexpected, and learning from experiences. I just observed the power of the playground approach on an outing into the woods with my grandchildren. 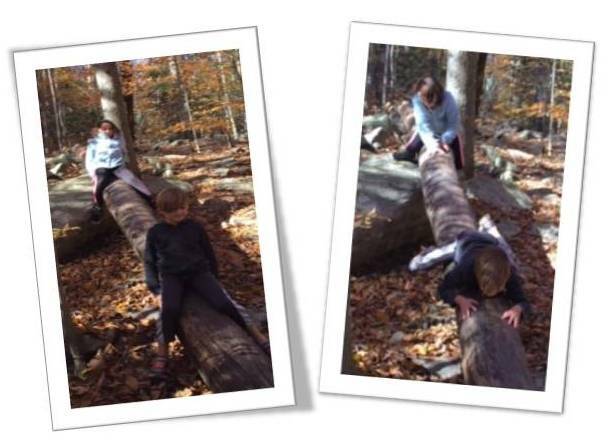 As they began to play on a fallen tree trunk, they created games, strategies, stories, and competitive as well as collaborative games. This activity lasted over 30 minutes while countless other rocks and water waited for exploration. We will be returning to the site. Are the 4 Ps present in your PLCs? As you observe PLCs or read the minutes and agendas do you envision a playpen or a playground approach?